Always a sea-faring city, the mainland port city of Brunswick constantly has shrimp boats coming and going up and down the coast and huge ocean container ships that unload and take on cargo at the deep-water terminals at Colonel’s Island, Mayor’s Point, and Marine Point. Brunswick has a fascinating history that goes back to 1738 when Mark Carr, the first settler, landed there and established a 1,000-acre tobacco plantation. 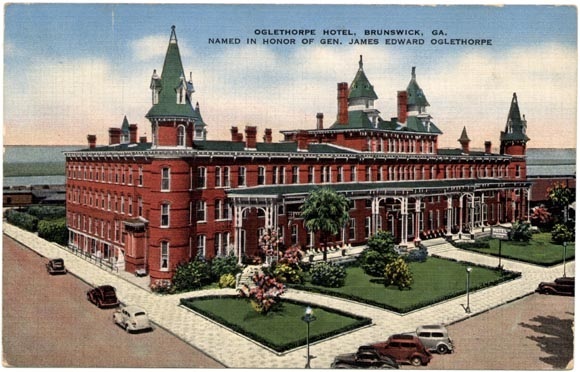 He owned that until it was purchased in 1771 by the Royal Province of Georgia, when Brunswick was founded. The layout of the town’s streets, squares, and parks followed Savannah‘s plan of being delineated in a grid style. The names honor many royal and well-known British citizens at that time such as George Street for King George III, Halifax Square for the second Earl of Halifax, Prince Street for the Prince of Wales who was the eldest son of George III. Newcastle Street for the Duke of Newcastle who later became the Prime Minister of England, and so forth. Enjoying a renaissance, there is always ongoing restoration and renovation of historic buildings and public squares. Markers located throughout the town explain historic sites such as the Old City Hall with its distinctive clock tower built in 1889 and the Ritz Theatre built as the Grand Old Opera House in 1898 and its recent addition of a restored original RITZ sign. The Ritz Theatre is the center for performances and exhibits by international, national, regional, and local artists, and its historic restoration is still underway. There was a building boom following the Civil War, and homes and businesses reflected Victorian architecture. You can still stroll down the streets with their magnificent oaks and view those spectacular structures. Both male and female workers built and launched approximately 99 Liberty ships from the J.A. Jones Shipyard from 1943 to 1945, including an amazing seven in just one month. These ships were acknowledged to be an integral part of the war effort in America.